Sharpen your mind, for the dark mysteries that once stood before the great Sherlock Holmes are now yours to solve. 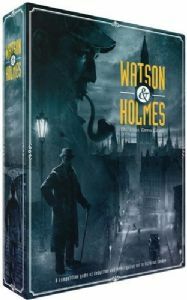 In Watson & Holmes, two to seven players are presented with one of thirteen cases, each accompanied by a series of questions. Players must travel from location to location in order to obtain clues and information, competing to reach the most coveted destinations first and sabotaging their opponents along the way. Once a player feels they have successfully uncovered the truth, they may approach Watson and Holmes with their conclusion. If their answers are correct, they win the game, but if they miss the mark, the other investigators must continue the search until the case is solved. Each of the thirteen cases included in Watson & Holmes provides the competing detectives with a collection of initial clues and information. 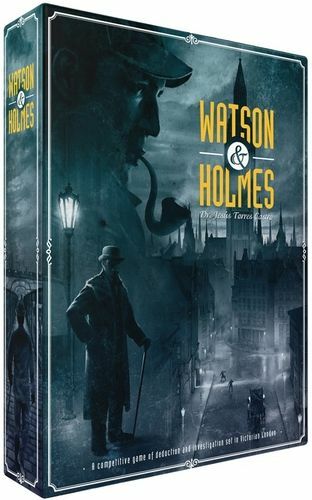 The front of each case booklet indicates a card layout, forming the game board, while the back provides a short narrative, describing how the dynamic duo came to investigate the case and what little information they initially had to work with. Varying in difficulty, the amount of time and attention to detail required will be different on each case. With new and different locations to visit each and every time, none of the investigators will begin with any kind of advantage when tackling a new case. Once the details have been introduced and the cards laid out, the detectives will alternate between two phases: Visiting and Investigation. During the Visiting Phase, each player will choose a location to investigate. However, until every player has placed their pawn on a card, others can steal the location from them by bidding carriage tokens. Players also have the option of placing their pawn on the Carriage Stop, learning no new information, but gaining three carriage tokens to use on later turns. Once each player has settled on a card, the game proceeds into the Investigation Phase. During the Investigation phase, each player reads the information on their chosen location card, taking down notes as desired. Players also have the option, during the Visiting Phase, to spend four carriages to claim Watson as their ally, thus forcing another player to read aloud their location card during the investigation. Though this can be an effective way to devalue the progress that player has made, it does provide valuable information to all players, setting each investigator on a race to the next location they interpret to be most informative. To help you along the way is a ring of Holmes and Watson's trusted contacts, each with unique abilities to help you quickly and effectively solve the case. With abilities allowing you to claim useful tokens at times, pay fewer tokens at others, limit other players' abilities, or take on the unique skills their characters possess, these allies are invaluable assets in any investigation. These character cards may only be used once during the game, but some have lasting effects, and all of them can ultimately mean the difference between victory and defeat. The police are also useful friends to have, interested in protecting and observing these spaces. If a player possesses a police token, they may leave it at a location before departing in order to disrupt the progress of their opponents. Other detectives may bypass the police on their own, if they are able to use a token to pick locks, or they may use their own contacts at the police department to call off the police, reopening the location for everyone.